Too much, too late. That sums up the impact of rainfall on wood stork nesting in south Georgia this year. DNR surveys in May – when drought was turning the region to dust – estimated 1,903 nests across 19 counties for the endangered birds. 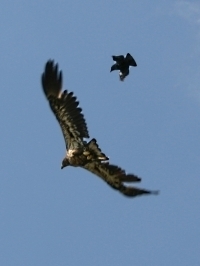 That’s down from 2,136 nests in 2011 and 2,696 in 2010, the most surveys by air began in the 1990s. Then came surges of rain. Follow-up checks last week were sobering, suggested survey leader Tim Keyes, a wildlife biologist with the Georgia Department of Natural Resources' Nongame Conservation Section. Keyes estimated that average production will be well below one chick per nest. The recovery plan for wood storks targets 1.5 chicks per nest. These big wading birds – America’s only true stork – nest over water and depend on wetlands for food. Too little rain dries wetlands and leave nests vulnerable to predators, like raccoons. Too water much disperses fish; less concentrated prey is harder for wood storks to catch. The birds feed by running their opened beak through the water and snapping it shut when it touches prey, a technique called tactolocation. Nest fluctuations are normal. And with the lack of rain in late winter and early spring, the low numbers aren’t surprising, Keyes said. 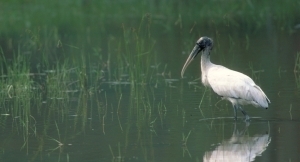 However, the long-term trend for wood storks in the state remains positive. “Still a lot of wood storks will be produced in Georgia this year,” he said. Colonies in the state this year ranged in size from four nests at a Grady County rookery to 464 at Harris Neck National Wildlife Refuge in McIntosh County. Colonies in southwest Georgia are usually less stable than those in coastal counties, where many wetlands used by storks are influenced by tides – more reliable than rainfall. Wood storks were federally listed as endangered when breeding pairs in the Southeast dropped to about 5,000 in the late 1970s, down from as many as 20,000 in the 1930s. About 12,000 pairs nest in Florida, Georgia and South Carolina. Georgia has about 20 percent of the U.S. nesting population. 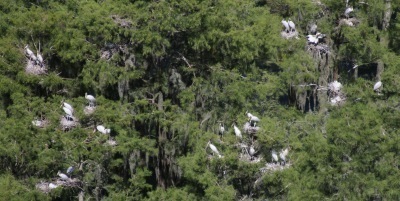 More than 75 percent of stork rookeries in Georgia are on private land. The success of conservation efforts for this species depends on landowners’ willingness to ensure the protection of viable freshwater wetland nesting sites. Regionally, populations must reach the recovery goal – a three-year average of 6,000 pairs and 1.5 chicks per nest – to down-list the species to threatened, a move the U.S. Fish and Wildlife Service is weighing. On sandy scrubland within sight of Plant Vogtle’s cooling towers, scientists are working to learn how to cool the heels of relocated gopher tortoises. The gopher tortoise is a keystone species in longleaf pine communities. Its burrows provide habitat for hundreds of other species. Its vegan diet returns nutrients and seeds to the soil. But, like most reptiles, gopher tortoises also have “very strong site fidelity,” said senior wildlife biologist John Jensen. They know where they came from and often try to return – undercutting efforts to conserve them. The study at Yuchi, adjacent to the Vogtle nuclear plant south of Augusta, centers on two acclimation “pens,” each covering about 2.5 acres and surrounded by silt fence. One pen that had been home to 18 relocated gopher tortoises since last fall was removed this month. The Orianne Society, a nonprofit conservation organization working with the DNR, is using radio transmitters to track 10 of those turtles. The other pen, donated and built this month by Morgan Corp. of South Carolina, will hold tortoises displaced from land development in Brunswick and Valdosta. That pen will be pulled next spring. On a rainy day three weeks ago, Orianne Society research ecologist Javan Bauder, head of tortoise trapping and monitoring, was setting live traps in burrows in the first pen and weighing and marking a young tortoise bound for the second. Before-and-after body weights will help gauge the quality of forage in the pens, determining if they’re large enough to maintain healthy tortoises during their acclimation period. But it’s the tracking that will hopefully link the time held to success in relocating tortoises. Those simply turned loose at a new site “tend to start bee-lining back to where they came from,” Jensen said. One south Georgia tortoise in a different study traveled 13 miles after it was released. The Yuchi project is aimed at keeping displaced gopher tortoises put after the fences go down, contributing to the species’ conservation in the long run – or crawl. The project at Yuchi also involves Plant Vogtle, Southern Company, Georgia Power, The Nature Conservancy and DNR’s Game Management Section. Georgia Power is restoring longleaf pine and other habitat near Yuchi WMA that could also serve as a relocation site for displaced tortoises. The area is already part of the Safe Harbor management program for federally endangered red-cockaded woodpeckers. 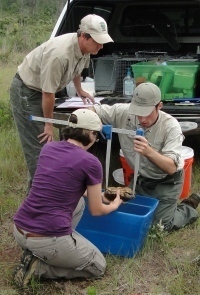 Yuchi’s gopher tortoise numbers are not considered viable without augmentation. Releasing tortoises will bolster the population at the Burke County WMA, where prescribed fire is being used to restore habitat for such fire-adapted species. While doing related tortoise research at Yuchi recently, John Jensen and Nongame Program Manager Matt Elliott discovered a population of sandhills milk-vetch, state-listed as threatened. Read more about the Yuchi gopher tortoise project in this Augusta Chronicle story. Midway through the sea turtle nesting season, loggerheads are on pace to match or beat last year’s record nest total in Georgia, with 1,043 nests as of June 20 compared to 1,044 in 2011. For Sea Turtle Program Coordinator Mark Dodd, the news is exciting – loggerheads have averaged about 1,000 nests annually over the past 23 years – and a bit of a cliffhanger: Will nesting end sooner than normal, given the 2012 season’s early start, or continue through August? Nesting updates. McDuffie Environmental Education Center near Thomson has dedicated its new digs. The larger building, part of DNR’s network of regional education centers, replaces two rundown, portable buildings bought used for $1 each in 1999. A Nongame Conservation Section effort to begin acoustic monitoring of bats drew a crowd of volunteers. News of the Anabat program sparked a rush that quickly filled the 31 routes and led to stories like this one. A national wildlife refuge protecting Southern Appalachian bogs is proposed for parts of North Carolina and Tennessee. The U.S. Fish and Wildlife Service says it will work with willing landowners to assemble the refuge focused on mountain bogs, which are found in Georgia and rated one of the nation’s rarest habitats. Also: Mississippi refuge renamed in honor of former Director Sam Hamilton. Sheffield Wildlife Management Area in Bartow and Paulding counties has grown by 1,050 acres. The recent DNR acquisition offers more room for outdoor activities from hunting to birding at Sheffield, which along with adjacent Paulding Forest Wildlife Management Area is among the state’s most popular WMAs. A new North Atlantic right whale mother and calf, plus the Navy’s Atlantic draft environmental impact statement, are explored and explained in the latest Right Whale News. The young bald eagle found emaciated by DNR Paradise Public Fishing Area staff and rehabilitated by the Southeastern Raptor Center received a rousing welcome home at the Berrien County PFA June 16. About 100 people watched as the released eagle flew across a field, landed in a pine tree and was promptly harassed by crows (left). A case involving the shooting an endangered whooping crane has a South Dakota man facing charges of violating the Migratory Bird Treaty Act and witness tampering. Jeff Blachford pleaded not guilty. He allegedly killed the crane and a hawk in April near Miller, South Dakota, then tried to persuade a witness to withhold information, according to the Fish and Wildlife Service. Encourage your kids to "Get to know your wild neighbors" this summer. The free contest offers prizes such as a trip to Disney’s Animal Kingdom Theme Park to encourage youth to connect with nature through the arts. Details. The Georgia Naturalist Rally at Stone Mountain Park Sept. 15 will explore the park's natural areas with hikes and other activities, some led by DNR biologists. Learn more. The black-capped petrel may warrant federal protection. The recent “90-day finding” by the Fish and Wildlife Service triggers a more thorough status review of biological information about the seabird species, which ranges from the Caribbean to the North Carolina. Video: "DNR wants your help to track bats," WALB-TV (Albany), and others via AP. bird north. 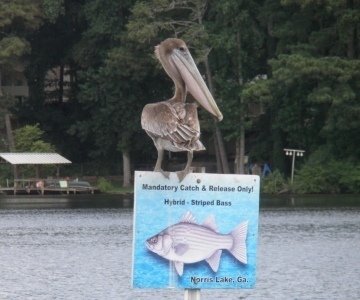 Ditto for an adult brown pelican spotted at Lake Lanier this month.